More than a few people undervalue the importance of a properly insulated attic, when in fact it is one of the most essential components of a modern roofing system. Attic insulation contractors at Easton Roofing discuss the benefits of proper attic insulation. The attic is part of the building energy envelope, an enclosure that also consists of the exterior walls and fenestrations (windows, entry doors and skylights). An ideal energy envelope ensures the stability of the indoor living space by minimizing heat transfer between indoor and outdoor spaces. Therefore, a properly insulated energy envelope is less at risk of heat loss during the cold seasons and heat gain during the hot seasons. Since the roof is the biggest area of the house that is exposed to sunlight, proper attic insulation helps reduce the heat that would otherwise get absorbed through the roof. Energy Savings — The lower the heat transfer rate is, the less the heating and cooling systems are needed to compensate for the indoor temperature difference. The reduced required output from the HVAC systems results in significant energy savings, compared to roofing with leaky attic insulation. More Comfortable Indoor Spaces — Consistent indoor temperatures make the home more comfortable during weather extremes. This is especially true in homes that feature converted attic spaces. Minimizes Damage Caused by Temperature Extremes — Exposure to temperature extremes can cause wood fibers to warp, which could result in permanent damage to certain structural components. 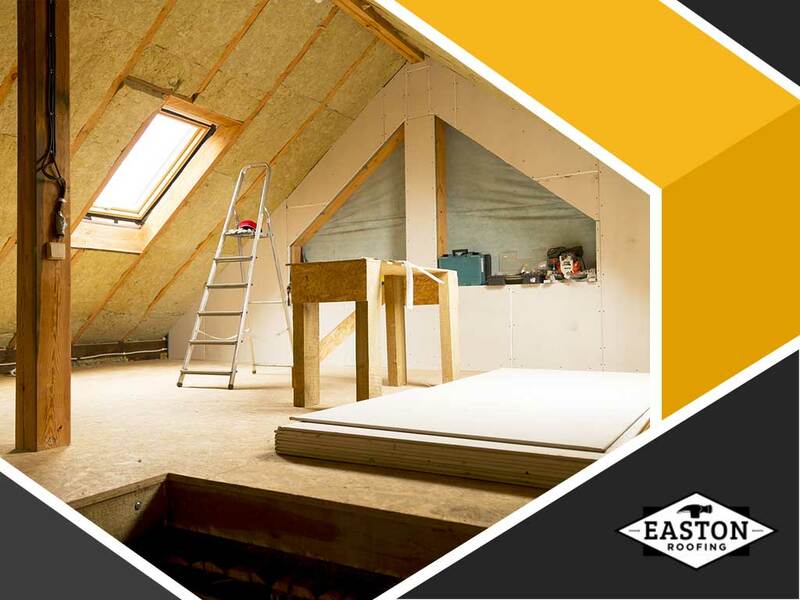 Insulation requirements vary per home, so your attic has to be assessed by an insulation professional before installation. The right kind and amount of insulation gets the best results as opposed to installing too little or too much insulating material in the attic. Easton Roofing is your leading insulation and roofing company. Give us a call at (913) 735-8534 (Kansas City, KS), (816) 545-9778 (Kansas City, MO) and (785) 246-9449 (Lawrence, KS). you can also fill out our contact form.